Short rotation coppice (SRC) is a biomass production system for energy usually grown on former agricultural land with fast-growing tree species. In Sweden, willow SRC has been grown since the late 1980s. SRC on arable soils may induce changes in some soil quality parameters due to differences in crop characteristics and management practices. 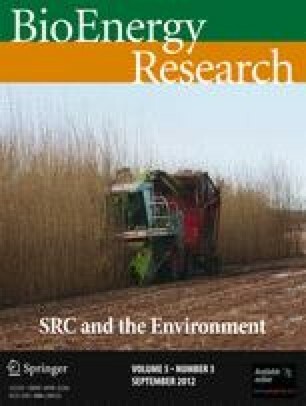 In this study, pH, organic carbon (C), and trace element concentrations in the soil of 14 long-term (10–20 years) commercial willow SRC fields in Sweden were compared with those in adjacent, conventionally managed arable soils. The results showed that organic C concentrations in the topsoil and subsoil of SRC fields were, on average, significantly higher (9 % in topsoil, 27 % in subsoil) than in the reference fields. When comparisons were made only for the ten sites where the reference field had a crop rotation dominated by cereal crops, the corresponding figures were 10 % and 22 %. The average concentration of cadmium (Cd), which is considered the most hazardous trace element for human health in the food chain, was 12 % lower in the topsoil of SRC fields than in the reference fields. In the corresponding comparison of subsoils, no such difference was found. For chromium (Cr), copper (Cu), nickel (Ni), lead (Pb), and zinc (Zn), there were no significant differences in concentrations between SRC fields and the reference fields in either topsoil or subsoil. Negligible differences in pH in the same comparisons were found. The authors wish to express their gratitude to all the land owners who allowed us to take samples and also provided valuable information on previous management regimes. Special thanks to Richard Childs, who helped with the soil sampling at all the different locations. The study was funded by the Swedish Energy Agency project 31455-1 within the framework of ERA-Net Bioenergy, which is gratefully acknowledged.